Ada I've gone through all the Italians in Montague county and checked every one of them to see if there were any families that could possibly be Arrigoni (any and all variations) and nothing for the 1930 census. Nocona is in Montague county and nothing I checked all Carminati (any and all variations) and no Arrigoni by them in 1930. I haven't given up I'll keep checking. One thing I did very early today, but will wait to post, is a list of all of the census from Texas that have your surnames. I don't want to overwhelm you until you've had a chance to look at everything posted in this thread. I'm just looking at your names again and somehow I missed Castelletta and Marchini. Can you tell me where they were (all states) in the USA? Billie, you are too kind! You are doing a great job for me, thank you. Don't worry so much. May the Carbonatis and Arrigoni left US and this might be the reason they disappeared. Another surname in Montague county was "Nobile". This is a very common surname too. Not all of them were related to my family as there were Nobiles in towns near Bogogno. I still have to go through all records you and Biff posted. I will give details also about Gallos and Mascagnis. Must go to see my doctor now . I have LDS films for Bogogno's birth, death and marriage Acts. This is why I know people's birth dates and who they are. I must say that in this town they were all related as first cousins, or brothers in law, or sisters in law or second cousins and so on. They also had nicknames as many had same surnames and names and born in the same year. Two years ago I found an obituary on line and could locate a descendant of Giovanni (John) Sacco (brother to Attilio and Federico) in California. We shared info on the family but his parents moved from Centerville to Illinois then to Wisconsin and to California. He's not in touch with other relatives so he only knows what his parents told him years ago. Angelo and Pietro were Francesco (Frank) Nicolazzi and Maria Marchini's sons. line 11 giuseppe pastore going to nyc here from 1892 to 1897 kansas city Giuseppe Pastore, born in 1864, is also a relative, his mother was a Sacco and grandmothers were Guglielmetti and Nobile. In 1911, when his daughter got married, he sent his consent from Saint Louis, US. Don't know what happened to him. I saw this manifest. Although they declared they were going to NYC, I believe they were all going to Centerville or nearby. Ada was there was a filippo gallo? No, these Gallos are not my relatives. The Francesco Gallo, related to my maternal family, was born in Favria (Torino) in 1867. He had an adventurous life as a soldier in Africa. He went then to Canada between 1890 and 1895 but I don't know if there are manifests. He lived in Canada for few years then went to somewhere in Illinois and after to Centerville or nearby. He paid a ticket for his brother Pietro (Peter) who reached him in US. Peter married Antonia Nicolazzi (daughter to Frank Nicolazzi and Maria Marchini) about 1900. They had three children: Joseph, Frances, Pete. -Angelina who married Giovanni (John) Sacco. -Josephine who married Giovanni's brother Attilio (aka Albert). -Edith - don't know who she got married to. I saw some listings for this family on ancestry but I don't have images. I know that Antonia died around 1951 so Frank went to Illinois and lived with Josephine and Albert/Attilio. He might have died soon after. Giuseppe Pastore, born in 1864, is also a relative, his mother was a Sacco and grandmothers were Guglielmetti and Nobile. In 1911, when his daughter got married, he sent his consent from Saint Louis, US. Don't know what happened to him. If this is the correct Giuseppe I'll find the 1920 and 1930 census info for you. would you like the image for this manifest? I can easily download and post for you. 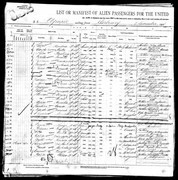 Thank you Elisa for posting the 1920 Census. They were living in Vermillion, very close to Centerville, Iowa. It looks like Frank (Francesco) says he immigrated in US 1893. As far as I know he was in Canada before. Are there border crossings for that period ? I was trying to find him in the boarder crossings but no luck so far. I will search this afternoon and with a little luck we'll find him. Thank you for searching but no, it's not him. He was in US in 1910 but his family was in Italy. His wife's name was Rosa. Their daughter was Teresa. I don't think his family ever went to US, he might have come come to Italy at the end, who knows. Elisa, thank you but I could download the image. Ambrogio Gugliemetti arrived june 25 1910 from le havre on jun 18th line 27 going to centerville iowa to his brother in law giuseppe Sacco. His wife teresa is still in bogogno he's a blacksmith. Ambrogio Guglielmetti's wife was sister to Giuseppe Sacco. Ambrogio came back to Italy and died there. I'm interested to Giuseppe Sacco's family. 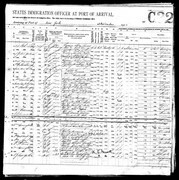 I saw a 1910 census on FAMILY SEARCH site (now disappeared) where he declares he immigrated in 1902 but I couldn't find a ship manifest for him. His name could have been badly mispelled or I just missed it. He was born in Bogogno on September 11, 1884, his father was Luigi (died in 1888) and his mother Serena Vecchio. In November 1913 his mother Serena goes to US on Olympic. She's listed as Serene Sacco and travels with her daughter in law Ernesta Sacco and two children, Luigi and Angelina both born in US. Ernesta and Serena used their married name and I could find out that Ernesta' maiden name was Mascagni as her brother Serafino was in her house in 1910 and, as Biff found, there was also a Galileo Mascagni and they were all from Lizzano in Belvedere, province of Bologna. But I couldn't find Ernesta first travel to US. In 1910 Census she declared she immigrated in 1901. So I wonder where she went in 1901 in US and with whom. I don't think a woman could go to US alone. Either she was with a relative or married to someone who died. When she travels with her mother in law in 1913 she declares she had been in Centeville from 1908 to 1912. This means she was somewhere else from 1901 to 1908. Also her age continously changes, she looks sometimes older and sometimes younger than her husband Giuseppe Sacco. Their first child was born in January 1910. I assume they got married in 1908-1909 somewhere in US. Serena (Vecchio) Sacco was 60 when she went to US and I suppose she never came back to Italy. She might be in a Centerville' cemetery. Ada it's strange that I can't find a 1910 census for her or Giuseppe. Ernesta does appear on the 1920 census with Giuseppe (Joe) Sacco her husband, her mother-in-law, the kids and a brother-in-law (Serafino Mascagni) who could be her brother. I was also thinking that Serafino could be married to one of Giuseppe's sisters or to one of Ernesta's sisters, which would make him Giuseppes brother-in-law also (just a thought) . I noticed Ernesta listed her mother in Italy ....... what is her mothers last name? Possible that Ernesta was in the USA with her mothers relatives in 1901? Biff might like to take a look at the documents. Hope you see something I'm missing Biff. At the end I said something wrong. The census I saw was 1920 and not 1910 and is the same you posted here above. Serafino was Ernesta's brother as Giuseppe (Joe) Sacco lost his father (Luigi) when he was only 4 years old. Giuseppe had two older sisters: Teresa married to Ambrogio Guglielmetti (the one who went in US in 1910 mentioned in my previous answer) and Rosa married to Martino Mora. Rosa died in 1908 when she was only 26. Where she's listed as Ernesti Sacco it comes out "other possible name: Ernesti Muscagne". Biff found Ernesta's brothers ship manifests. I had also seen those manifests before when I was trying to find a manifest for Ernesta's first travel (which I never found). Their mother's surname could be Guerrini or Guerrino (this surnames exist in Lizzano in Belvedere, Bologna). On 1913 ship manifest Ernesta (with children and mother in law) says her mother is Angela Guerina but this surname doesn't exist and her mother wasn't in Bogogno, the clerk mixed up Bologna and Bogogno I suppose. Could it be that Joe, Ermerta and Louis DAVIS are Joe, Ernesta and Louis Sacco? First names match although the surname is completely different. This could be the reason it's impossible to find them. Can you find this census so that we can see what's written? Last thing, on ancestry listings for 1930 Census there is a Serafino Mascagni married to Virgil DeMarchi and I suppose there weren't so many Serafino Mascagnis around. I hope I didn't mix up things too much. I know connections among relatives but for others reading it might look and sound very confusing. Here's the 1910 US Census. Definitely Joe and Ernesta Sacco, and Galileo Mascagni. thank you very much for posting the image. I suspected there was a mispelling. I would never have found Joe Sacco under Davis. I assumed that Galileo Mascagni was difficult to write and read so I searched on ancestry listings using only "Ga" for his name and "Mas" for his surname and I was quite lucky as a similar name came out. I wonder under what other name he was listed as I couldn't find him on any following census.